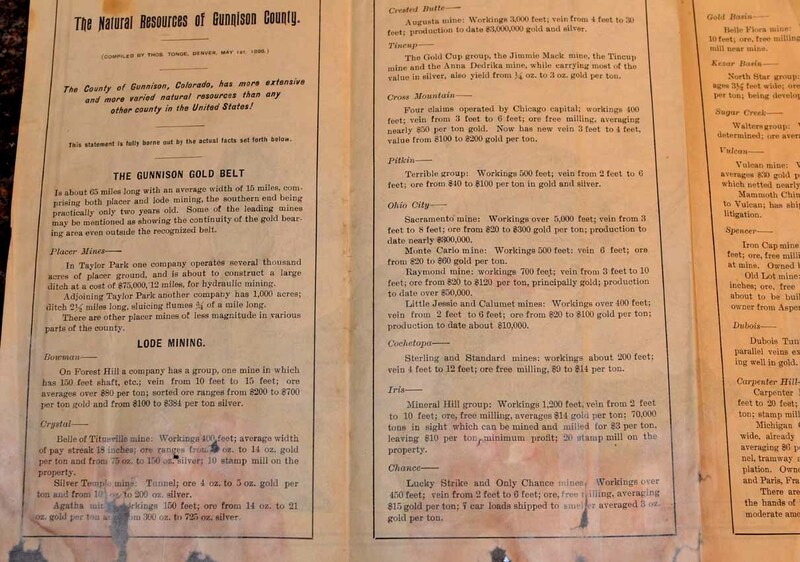 Presented with the Compliments of the Gunnison County Miners and Merchants Association. Published by The Williamson-Haffner Engraving Company, Sheridan Building, Denver, Colorado. 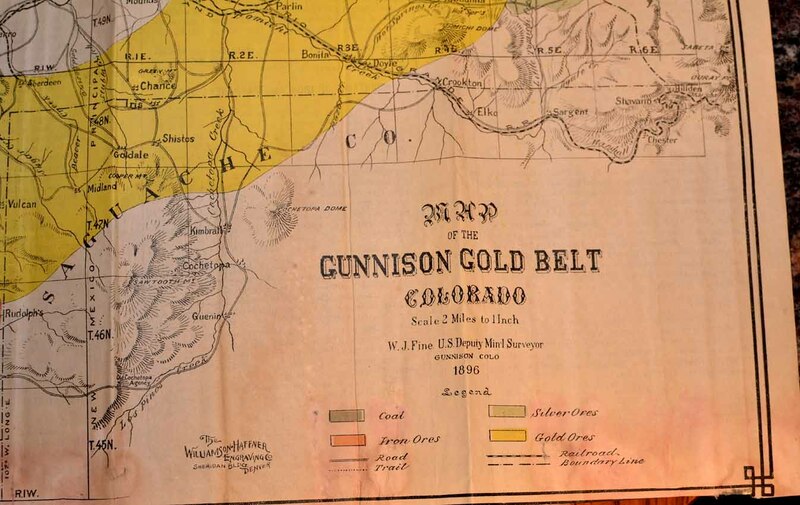 Map of the Gunnison Gold Belt, Colorado. Scale: 2 miles to the inch. By W.J. Fine, U.S. Deputy Mineral Surveyor, Gunnison, Colorado, 1896. 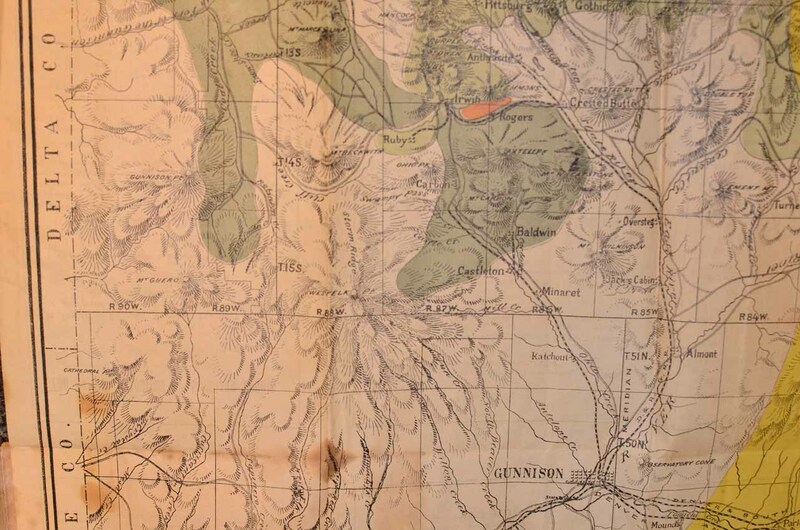 8 panels on back of map of promotional for: silver mines around Bowman, Tincup, Pitkin, White Pine, Crystal, Scofield, Irwin and Gothic; Copper and lead; Coal, both anthracite and coking; Manganese ores east of Gunnison City; Limestone; Fire Clay; Gunnison the Future Pittsburg of the West; Granite at Aberdeen; Marble at Yule and Crystal creeks; Sandstone, north of Gunnison; Slate on Yule Creek; Agriculture and Stock interests. 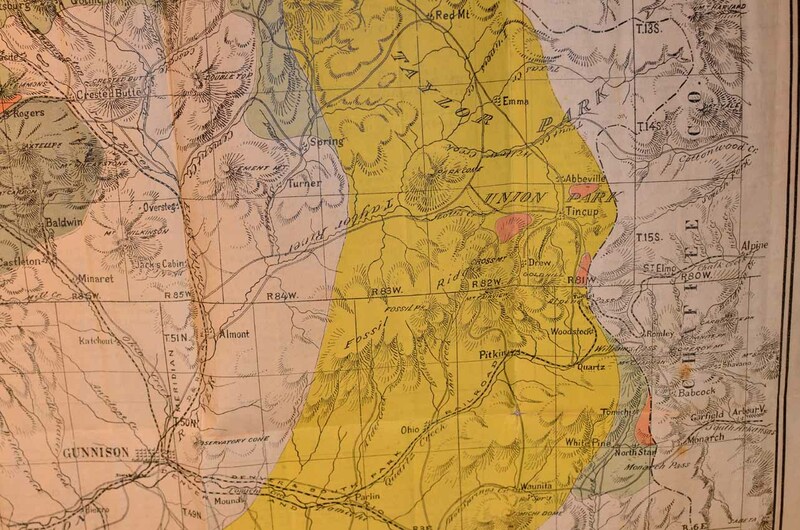 MMap locates railroads (Denver & South Park; Denver & Rio Grande), roads, topographical features, towns; gold, silver, coal and iron districts. 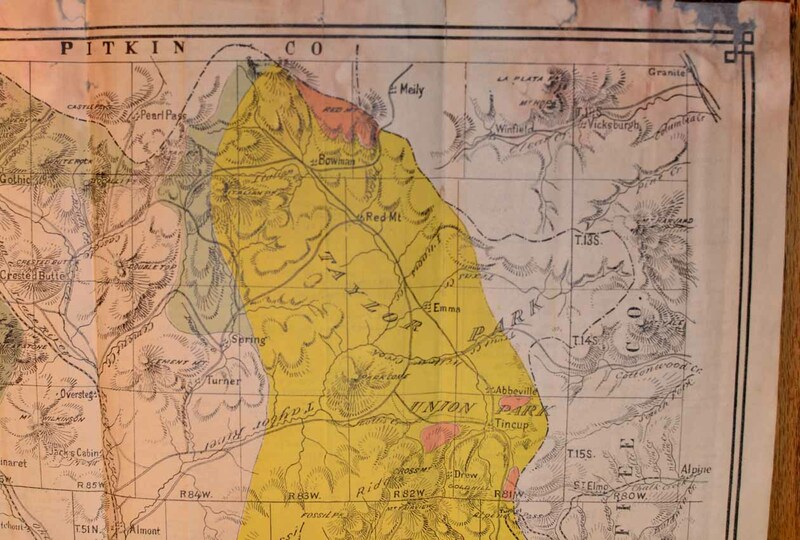 Locates numerous towns and camps long-since abandoned: White Earth or Rudolph’s; Meily; Goldale; Chance; Shistos; Spencer, Allen; Minaret; Rogers; Oversteg; Turner, etc. 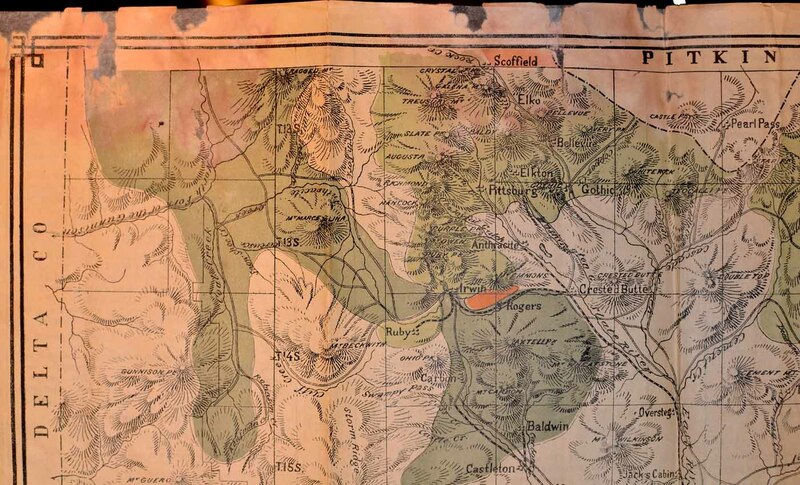 Map is 4-color. 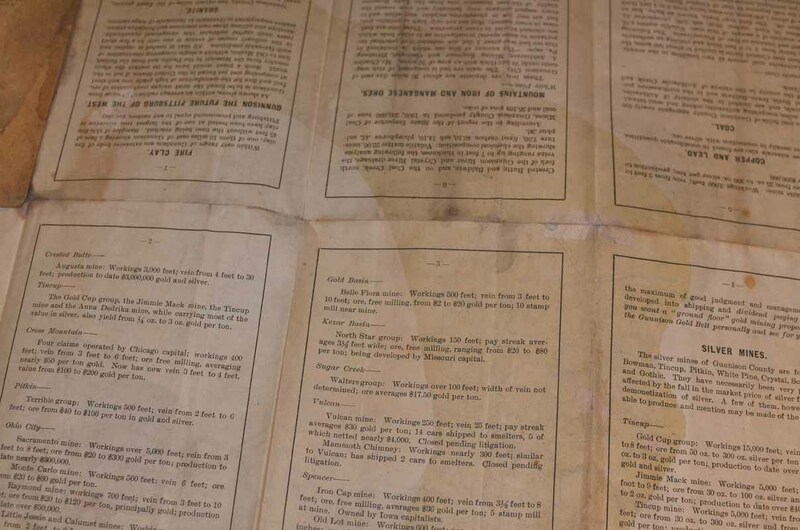 Damage: some damp-staining near edges with light discoloration; 7 tiny areas of paper-loss, mostly in margins; one small area of light brownish discoloration from folder covers near left-hand side of map; back cover of folder damaged from damp-staining. Generally, good plus to very good condition. 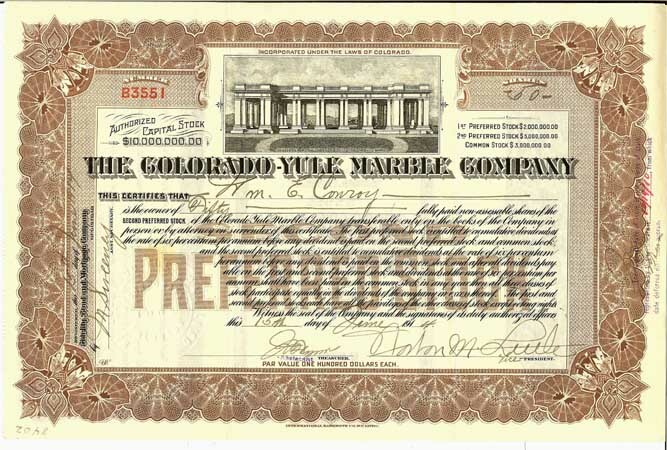 THE COLORADO - YULE MARBLE COMPANY, stock certificate Number B3551, issued June 15, 1914, uncancelled, near fine condition, usual two folds. 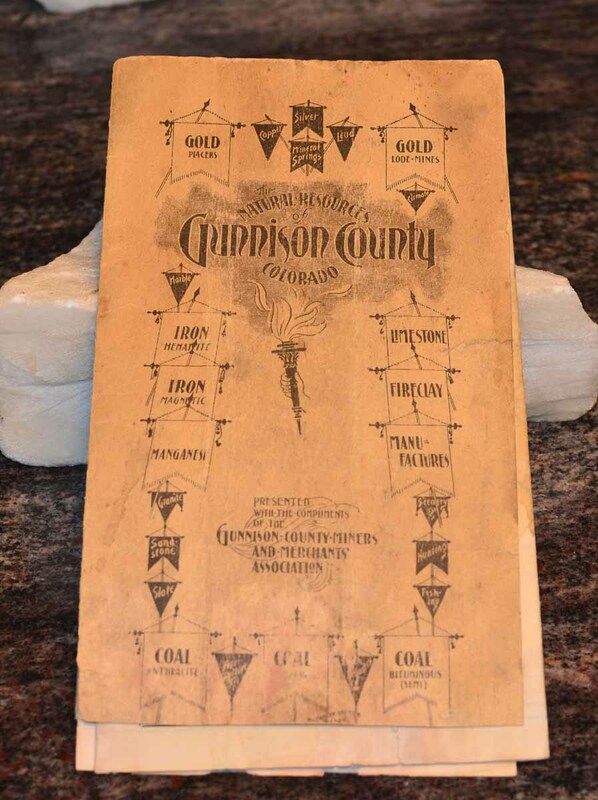 These shares were issued on the famous Colorado - Yule Marble quarry near Marble, Colorado. The marble from this operation became intricate to the architecture of numerous buildings and structures, such as the Tomb of the Unknown Soldier, the Lincoln Memorial, and the Cheesman Memorial. This certificate was engraved and printed by the International Banknote Company, New York. 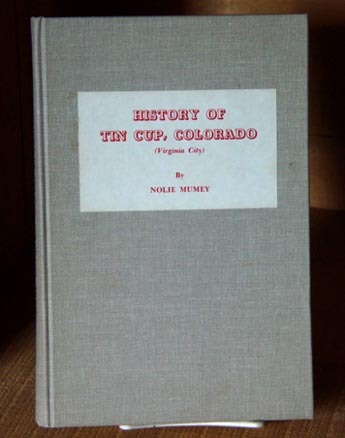 HISTORY OF TIN CUP, COLORADO (Virginia City): An Alpine Mining Camp Which Refused to Become a Ghost Town, by Nolie Mumey. Published by The Johnson Publishing Company, Boulder, Colorado, 1963, 1 of only of 300 numbered copies published; 222 pages; illustrated. There wasn't another edition, hardback or otherwise. 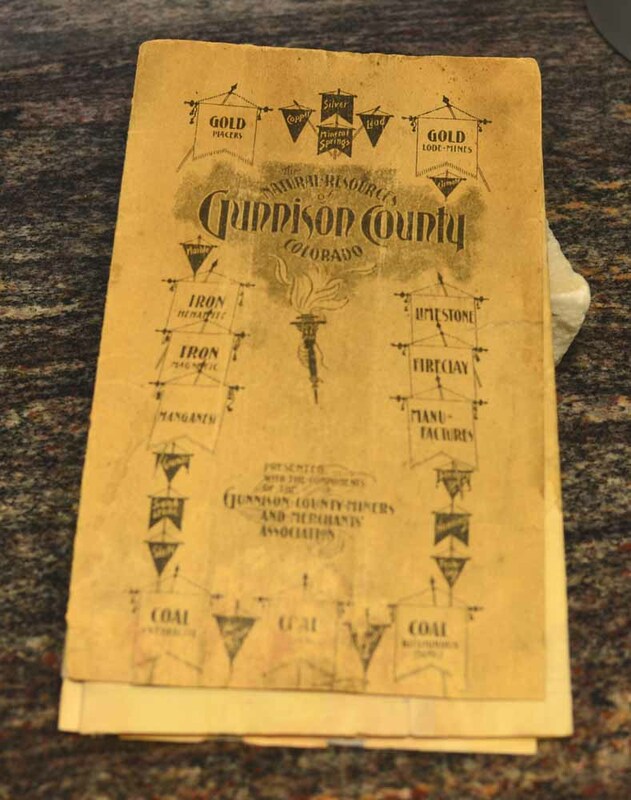 Condition: fine; two reproduction tokens in back pocket of book; replica tin cup and original dust jacket. 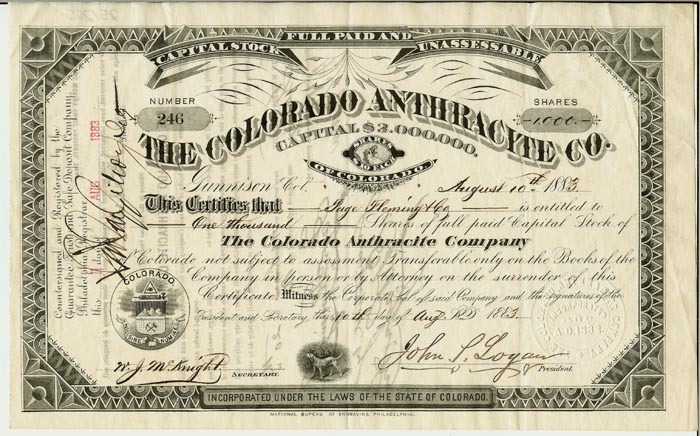 THE COLORADO ANTHRACITE COMPANY OF COLORADO, stock certificate Number 42, issued March 1,1882, uncancelled, several folds, but still in near fine condition. 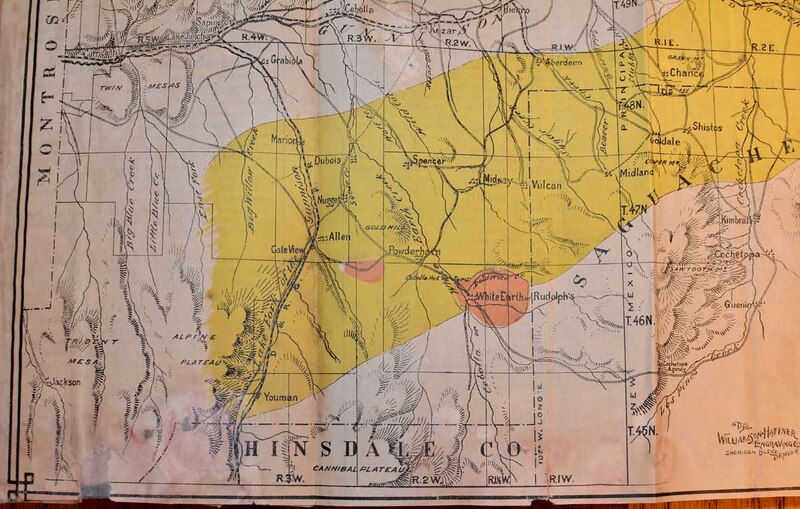 According to the 1883 Colorado Mining Directory (Page 326), this Company owned 2,560 acres of coal land, situated on the east and west side of Slate River, between O-Be-Joyful and Poverty gulches, near Crested Butte. 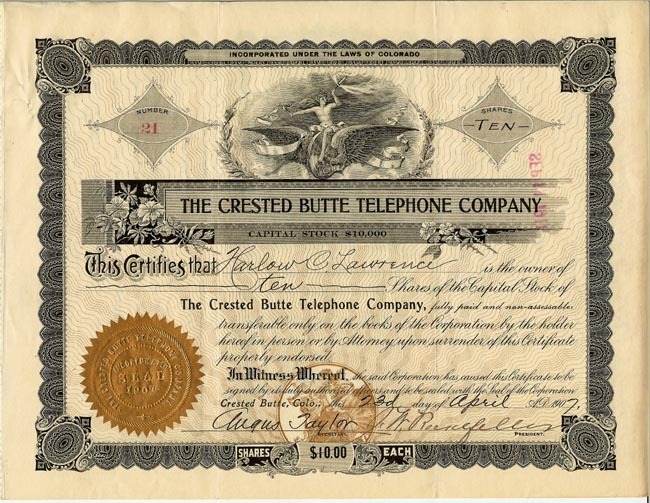 Stock certificate Number 47, issued March 30, 1896, uncancelled. Condition: near fine; usual two folds. 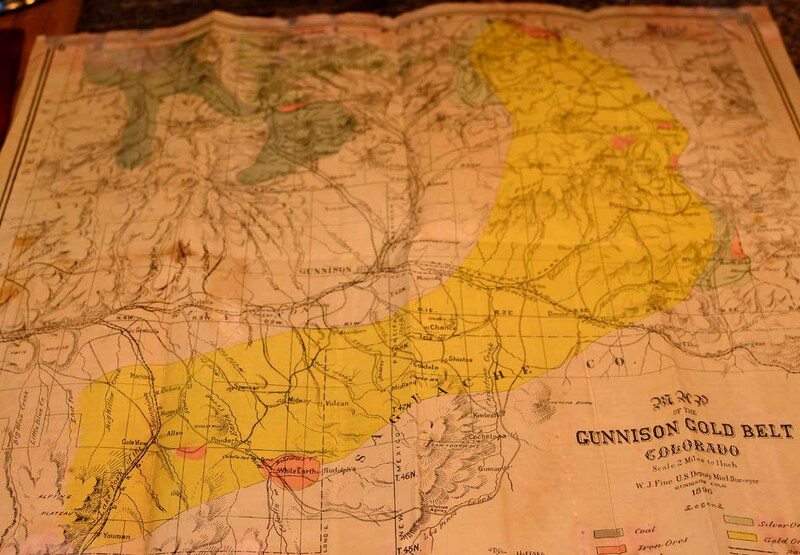 Stated on certificate: "Mines Located in Nugget Camp, Gunnison County." Issued April 14, 1892, cancelled. 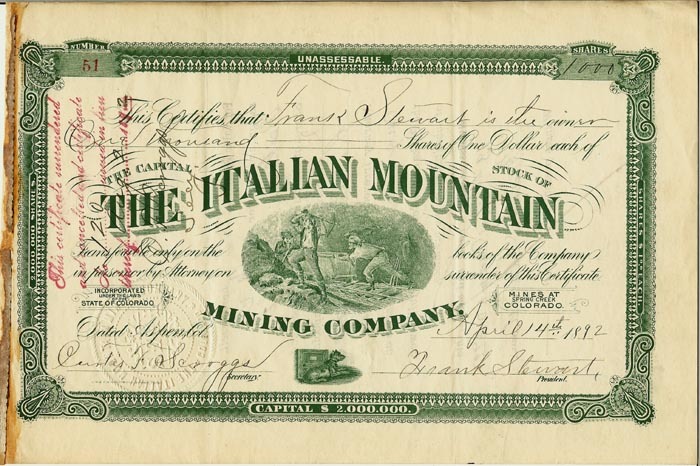 Stated on certificate: "Mines at Spring Creek, Colorado," on Italian Mountain, Gunnison County, Colorado. Company office was located in Aspen. 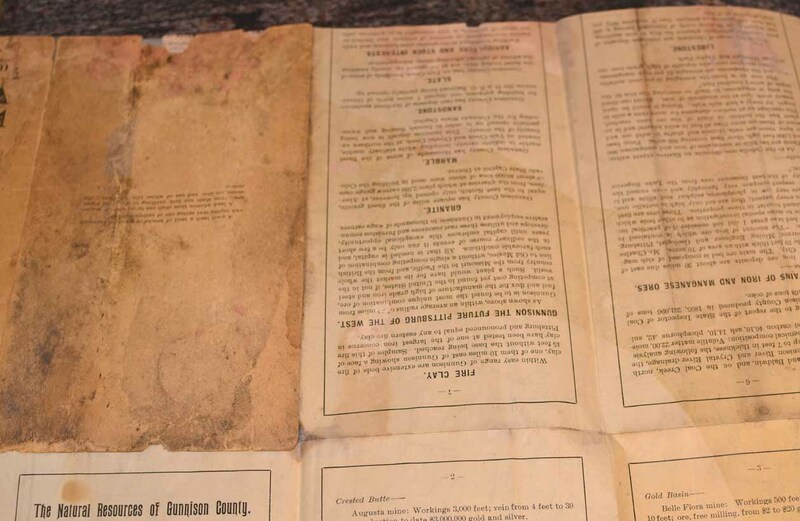 Condition: very good; some glue-staining and fraying to left edge. 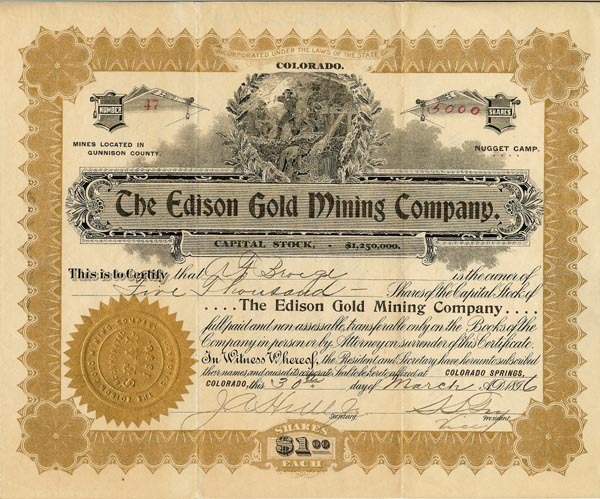 Stock certificate issued April 8, 1898; very good plus condition: several folds. 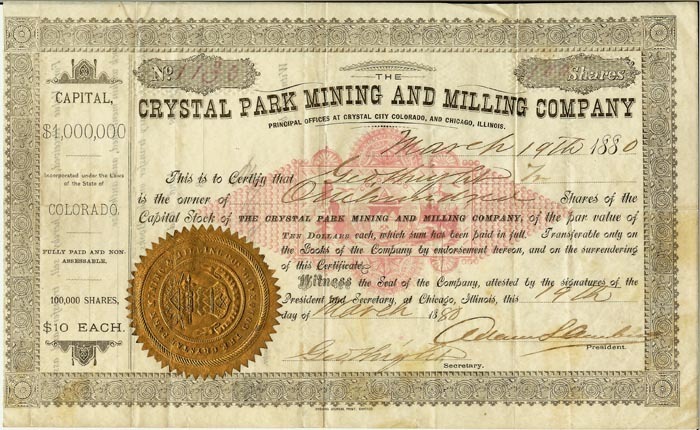 Stated on certificate: "Mines in Gunnison County, Colo." Certificate signed by Cripple Creek gold baron, J.R. McKinnie, as president. 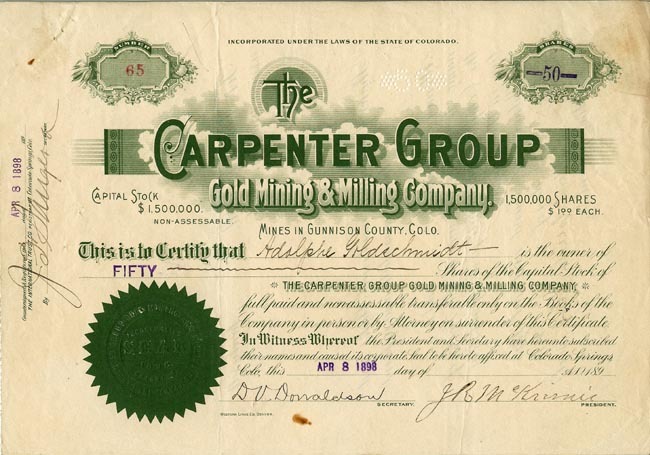 Stock certificate issued April 23, 1907, uncancelled. Signed by J.W. Rockefeller as president and Angus Taylor as secretary. Corporate seal affixed at Crested Butte, Colorado. Near fine condition. 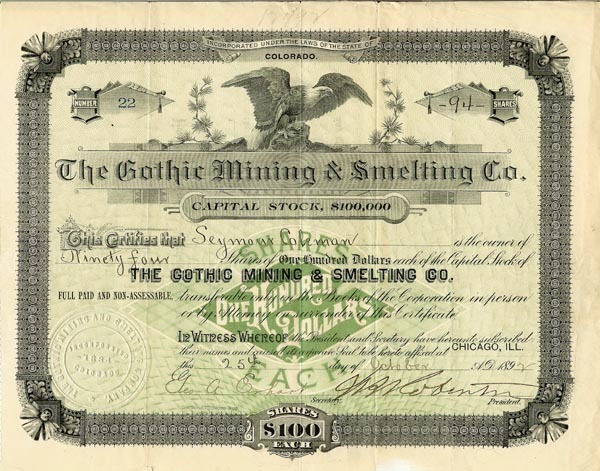 Stock certificate issued March 19, 1880; uncancelled. Principal Offices at Crystal City, Colorado and Chicago, Illinois. Crystal, Gunnison County, Colorado. Very good condition.